"Liquid Sky brings together a highly trained and talented troupe of diverse and passionate artists who create expressive performances with a mesmerizing display of grace, athleticism and the beauty of cirque entertainment. 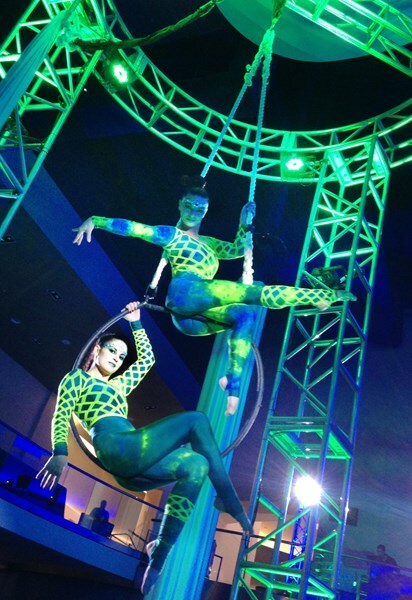 Our high-quality aerial acts and unique performances will elevate your private party, nightclub, fundraising gala, or corporate event to a higher level of excellence. We are your one stop shop for all circus entertainment and look forward to working with you." Please note Liquid Sky will also travel to Long Island City, Brooklyn, North Bergen, Bronx, West New York, Union City, Weehawken, Flushing, Fairview, Edgewater, Hoboken, Jersey City, Ridgefield, Cliffside Park, Palisades Park, Fort Lee, Secaucus, Ridgefield Park, Leonia, Englewood Cliffs.